California whitewater enthusiasts have been rafting on the Tuolumne since the 60's. The Main Tuolumne is located just west of Yosemite National Park, with some of the best California whitewater rafting in the Sierra Foothills. 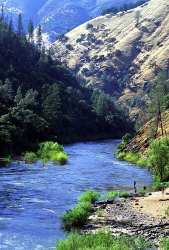 The Tuolumne is a premier California whitewater rafting river, and is also considered one of the all time Classic California whitewater rafting runs. The run starts at Meral's Pool and flows through 18 miles of intense boulder slalom rapids down to Ward's Ferry. Not only does this river offer challenging whitewater rafting, add excellent scenery and solitude and you get the Tuolumne. This website provides information for the whitewater rafting community. Inside you will find shuttle directions to Ward's Ferry & Meral's Pool, a mile-by-mile river guide, flow information, and more. Information is also provided about the different camping areas, how to obtain whitewater rafting permits, and information about finding a commercial whitewater rafting outfitter. Gradient: 40 feet per mile overall.